Having gambled on gaudy excess and nearly brought down the studio with the dismal failure of the Elizabeth Taylor star vehicle Cleopatra , the smart play for Twentieth Century Fox would've been to go for a safe bet to slowly recoup their expenses by avoiding the prospect investing in a film where the budget would run amok. Yet, Hollywood is known as the dream factory after all and you can't keep a dreamer from clinging to the fact that every once in awhile, gambles do pay off. 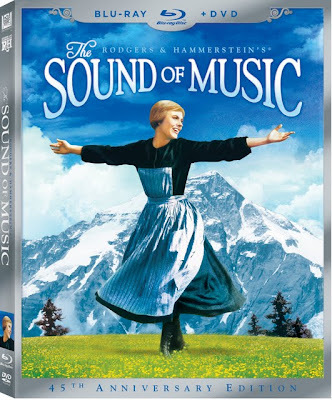 So ultimately it took another epic to undo the damage done to Fox by their previous epic as 1965's The Sound of Music went onto become not only the highest grossing and arguably most beloved movie musical of all time but also the historical feature that prevented Fox from closing its doors. And while in retrospect, it seemed like it should've been a surefire crowd-pleasing hit, intriguingly, the biggest criticism levied at the film to this day was precisely the same concern that kept delaying production in the '60s as directors from George Roy Hill to Gene Kelly and others passed left and right, acknowledging its syrupy, rose-colored depiction of Austrian life just before second world wartime. What finally changed his mind I'll never know, but I do suspect that it had something to do with not only Fox's fearless attitude towards putting their money where their mouthful of artistic reasons were but also Wyler's extraordinary amount of pre-production preparation. And indeed, scoping out European locations and talking to the real VonTrapps was critical even despite the fact that – as Wyler's wife revealed – her husband just wasn't as passionate about this project as he was about The Collector , which he ultimately jumped ship to direct before Wise returned for good. Yet William Wyler's greatest contribution to Music was in the audacious casting of Julie Andrews whom he'd not only seen on Broadway in My Fair Lady but also been enchanted by in the Mary Poppins footage that Walt Disney generously shared with Wyler. Unlike Cleopatra which was built around Hollywood's most prominent actress, Fox once again gambled by taking the opposite approach by allowing Wyler to contract a woman before any cinematic proof of the Broadway actress' charisma, charm and considerable musical ability had been released in theatres. When viewing this sumptuously transferred high definition version of the original 70mm epic film on Blu-ray today, from the very moment we see Andrews singing the title tune while twirling around on an Austrian mountaintop, it's impossible to imagine anyone else in the role. Just like Wyler's impeccable taste led the world to discover Audrey Hepburn in her very first role (that garnered her an Oscar), Music was bolstered by that same understanding of what makes a star. Namely, Wyler's hunch on the Disney lot not only paid off for Wise but also catapulted Music to the top of the box office since like Hepburn, Andrews' first film Poppins had led to Oscar gold. As the independent, feisty and strong willed nun-in-training Maria, Andrews stole our hearts. Endlessly testing the patience of her sisters in the convent because her inquisitive head's always in the clouds, eventually Maria is assigned by her exasperated Mother Superior to become a governess. Within the first act, Maria's sent to look after seven mischievous children being raised military style at the whistle-blowing beck-and-call by their father, the widower Captain von Trapp (Christopher Plummer). However, she holds her own against the rebellious kids determined to send Maria packing as just one in a long line of short-lived governesses by refusing to give into or acknowledge their pranks other than in a hilariously subtle conversation over supper that appeals to their guilty consciences resulting in tears. And predictably Maria quickly becomes fast friends with the affection and artistically starved children. In the tradition of Jane Eyre and countless other tales, both the handsome von Trapp and sweetly guileless Maria begin to recognize the initial stirrings of attraction toward one another, leading to a multi-layered conflict that sends the romantically naive, inexperienced Maria reeling. And honestly, the beautiful coming-of-age filled inspirational love story has more than enough charm to have ended there with a requisite Hollywood happy ending as all characters have – as movie storytelling dictates – grown and evolved for the better due to their relationships with each other as a new, large family. Unfortunately, however, Sound of Music overstays its welcome in an awkwardly clunky final act. Instead of following through on the main plot, the movie suffers when it starts exploring what happens to the adamantly anti-Nazi and anti-Fascist von Trapp and his family as Hitler's hold on Europe begins to spread and friends turn into enemies. Both the tone and the film's focus are shifted to the point where it feels like the last reel came from an altogether different Hollywood production or one wherein a new screenwriter and director had been called into replace the others, despite having little knowledge of everything that had occurred earlier onscreen. Likewise, because the war is just brought in like a new hurdle over which the cast must suddenly jump, it's easy to understand why Music has alienated some fans because it seems to trivialize and sanitize the true atrocities of the war. Had the film done a better job of using the political backdrop of the changing Austria as the subplot of the Music rather than merely forcing it into a movie that up until that point was about a nun at a crossroads between love for God and man, it may have been more effective than it ultimately is onscreen. For sadly as it plays, Maria is relegated from our heroine to a mere supporting player as Andrews becomes not the breath of fresh air in the children's lives but a slightly passive wife to von Trapp. Moreover, when you realize that it's quite contrary to what really occurred in the lives of the real von Trapps, taste-wise and for reasons of respect and authenticity, I believe it should've been handled differently or dropped altogether. Nonetheless, whether you prefer to watch it all the way through each and every time or – as I prefer – imagine that it ends after the wedding of von Trapp and Maria, The Sound of Music remains an unparalleled work of uplifting albeit saccharine fueled entertainment. Easily one of the most in-demand titles of the year, Music was released just in time for the gift-giving holidays and to help celebrate Fox's 75th birthday as well as Music's 45th anniversary. Additionally, this museum quality Blu-ray/DVD combo pack complete with bonus features and numerous ways to watch the film with an immersive feature length informative track, Andrews and Plummer commentary and a Glee approved sing-along edition reminds you why you upgraded your home theater system in the first place in a way that's sure to become one of your favorite things in high-definition.